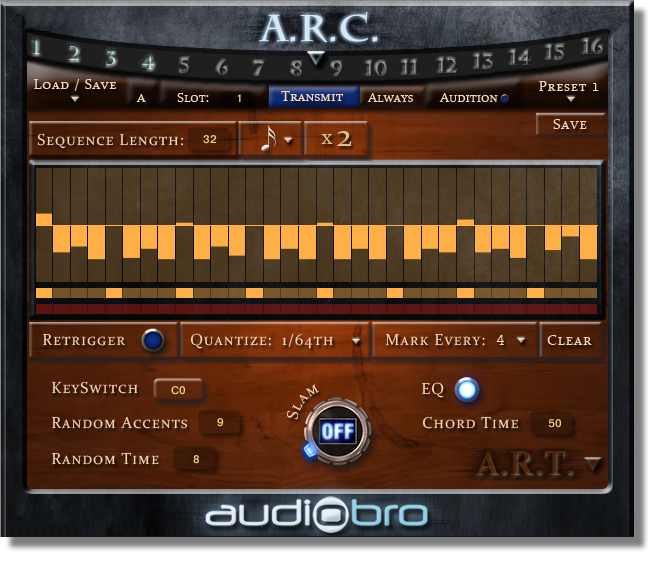 From this page, you can remotely batch control all of the Auto Rhythm Tool’s (A.R.T.) parameters. The A.R.T. is the engine behind all short articulations in LASS ­­— these would include: spiccato, staccato, pizzicato. By simply holding down the sustain pedal, you activate A.R.T. This allows you to play rhythmic patterns with unprecedented control and ease in synchronization… and it’s really fun!! Sometimes it’s very hard to play detailed accents and rhythms on weighted keyboards even at slow tempos… trying to do it at fast tempos can seem like a lost cause. This is where A.R.T. really shines. By taking a few minutes to learn A.R.T.’s features, you’ll dramatically improve the control you have over all your short articulations. Programming patterns in all your A.R.T. patches in 1 step from within the ARC’s A.R.T. page. Retrigger and Continuous modes — newly played notes retrigger the start of the rhythm pattern or they continue on and “join” the other notes at the same spot in the rhythm pattern. Quantize — a new approach to quantizing where only notes outside of the user defined note value are quantized. This allows the user to retain the human feel. Of course one can 100% quantize the notes. 10 user-editable presets that can be changed “on the fly” with Key Switches.